Astrophotographer Jeffrey Berkes of West Chester, Pa., snapped this stunning view of planet Venus and the crescent moon during a bright conjunction on Dec. 26, 2011. The planet Venus paired up with the moon Monday (Dec. 26) in an eye-catching sky show that dazzled skywatchers across the United States. And there's still time to catch the celestial display. This sky map shows how the moon and Venus will appear on Dec. 27, 2011 at 6:30 p.m. local time in the southwestern sky. Venus and the moon appeared near each other in the Monday evening sky in a cosmic alignment known as a conjunction. At sunset, Venus and the crescent moon could be seen shining brightly about 7 degrees apart in the southwestern sky (closer than your fist held at arm's length). "It was another cold, clear, and beautiful night in Truckee, CA," skywatcher David Smoyer told SPACE.com in an email. "The moon and Venus were so close together, shining through gorgeous sunset colors." The bright moon and planet Venus shine over the city of Truckee, Calif., on Dec. 26, 2011 in this photo by skywatcher David Smoyer. "It was a spectacular view, visually!" skywatcher Alfredo Garcia, Jr. told SPACE.com after observing the conjunction from Freer, Texas. "Loved the earthshine!" This week, Venus and the moon are setting about 2 1/2 hours after sunset along the southwest horizon. Venus is shining exceptionally brightly, and is currently about 11 times brighter than Sirius, the most luminous star in the night sky. The moon, meanwhile, is just a few days past its dark "new" phase and is steadily brightening. Tonight, it will be about 12 percent illuminated, about double the area lit on Monday night. The moon will appear about 10 degrees (the width of your closed fist at arm's length) above Venus for skywatchers with clear weather and an unobstructed southern view. A sky map of Venus and the moon for Dec. 27 is available with this story. 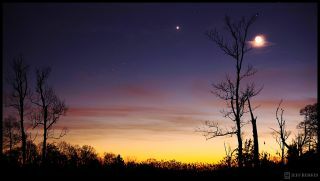 Astrophotographer Jeffrey Berkes of West Chester, Pa., captured haunting views of Venus and the moon on Monday, with a rundown cabin and naked trees lending an eerie quality to some scenes. "It was a great night, I even captured a few meteors and was able to get a portrait of a horned owl with the conjunction as well … all in the same frame!" Berkes told SPACE.com. "Great night, to say the least." If you miss Venus and the moon shining together this week, don't fret. A similar close conjunction of the two objects will occur on Jan. 25 and 26. The planet Jupiter is also visible to the unaided eye this month. Jupiter and Venus will appear closer each night until March 14, when they pass within about 3 degrees of each other. Editor's note: If you snap an amazing photo of Venus and the moon and would like to share it with SPACE.com, contact managing editor Tariq Malik at tmalik@space.com.